We decided a while back to start looking for a home away from home near the mountains of North Carolina. We looked at all the surrounding areas, including Bryson City, Franklin, and Asheville. We are far from impulse buyers and after looking for months and months, we finally narrowed it down that we would look for property in Cherokee, North Carolina. It just seemed to be the right fit as we would be incredibly close to the National Park as well as the Blue Ridge Parkway. There's enough to do to keep you busy, but it is remote enough to actually make you feel like you are on vacation. We started searching for a chalet and even stayed at some vacation rentals in the area. After months of looking, we eventually purchased this property. The first year we owned the house, we spent most of our time fixing it up. We had purchased it from an elderly couple who had done their best to keep it up, but mainly from a lack of time and resources, the house had become somewhat dated as far as the interior decorations. We replaced the hardwood floors throughout and modernized the complete interior. Actually the first year, Smoky Mountain cabin was not much of a vacation destination as it was work away from work. But we enjoyed it and we are happy with the results. Today, we get to enjoy the fruits of our labor and have a relaxing vacation at our private getaway. We make it there several times a year, so we ensure that everything is in working order. Through our time up there, we have become friends with many people in the community, and have hired several people to make sure our NC cabin rental is always in great shape for our visitors. We are not some commercial property management company that is going to put you through a bunch of hoops to enjoy a vacation in the Smokies. We want your vacation to be as relaxing as possible. In the hustle of today's world, everybody out there needs some more down time. We run our Cherokee Cabin website because we often stay at vacation rentals as well and know that there are really three main criteria we look at in picking a property to rent. First, we want to see pictures. Second, we want to see rates. And finally, we want to know availability. Most of the vacation rental directories tend to limit their users on what type of information they can put up in a reasonable way. Having a little bit of knowledge about the internet, we just went ahead and built our own site. On our website, you will find pictures, rates, and a calendar showing available dates for our Smoky Mountain Cabin. If you have any suggestions on ways to improve our site, we would love to hear from you! We also maintain information on local Cherokee NC Attractions. Every time we visit the mountains, we always try to see a couple new sites. Every time we find a new hidden treasure in North Carolina, we post the details of our trip on our website. We hope that this brings some value to you during your next trip to our cabin rental. So, the next time you are headed to the mountains, whatever you do, don't go and stay at some chain hotel. 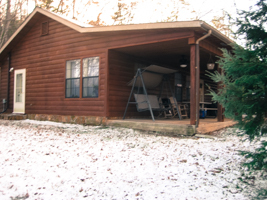 Whether you stay at Cherokee Cabin or another rental, you should take advantage of vacation rentals and have some space to spread out while you are on vacation. The layout of the cabin has 1 master bedroom on one side and the other two bedrooms on the other side of the house. So bring the kids, and rest assured that you will still get some peace and quiet at night. Many people do not realize that they can rent a house for about the same amount of money as a hotel would cost. And I know that we enjoy our vacations much more when we are not stuffed inside a 100 square foot hotel room for a week. So look through the website, enjoy, and if you have any questions, please feel free to contact Cherokee Cabin at any time.